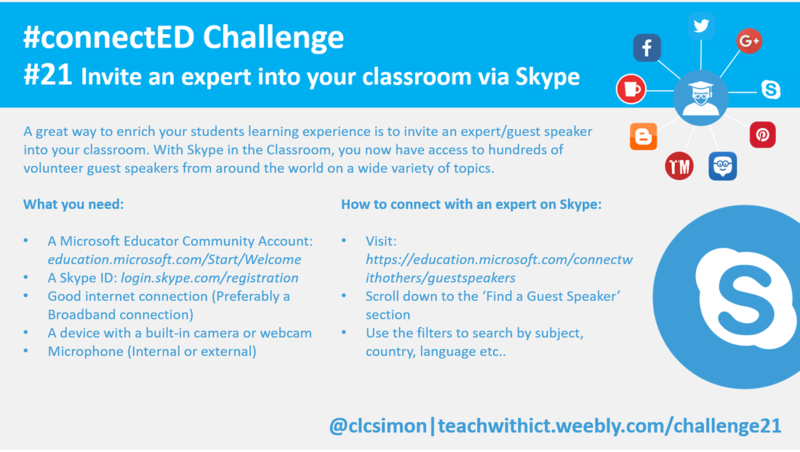 Challenge 21: ​Invite an expert/guest speaker into your classroom via Skype. A great way to enrich your students learning experience is to invite an expert/guest speaker into your classroom. With Skype in the Classroom, you now have access to hundreds of volunteer guest speakers from around the world on a wide variety of subjects. Finding an expert/guest speaker to Skype with. With Skype in the Classroom, you can search by subject and age group to arrange a time with a volunteer guest speaker best suited for your class. Use the filters to search by subject, country, language etc..
https://education.microsoft.com/skype-in-the-classroom/find-guest-speakers - Find hundreds of volunteer guest speakers from around the world on a variety of subjects.